Cladding on two of the schools so far tested following the Grenfell fire has failed combustibility tests, according to the Department for Education. The department has ordered all schools and colleges in England to carry out fire safety checks. Cladding on a secondary academy and a primary special school, both in London, was found to be "not of limited combustibility", says a DfE statement. Both buildings have been declared safe after extra checks, it adds. "As a precautionary step, both schools have already been inspected by the fire and rescue service, who confirmed appropriate measures are in place to mitigate the risks from potential fire, and the buildings have now been declared safe for continued use," says the statement. The DfE ordered all England's 22,000 schools to carry out a fire safety survey following the blaze at west London's Grenfell Tower, in which at least 80 people are believed to have died. And thousands of responses had now been received, a DfE spokesman said. 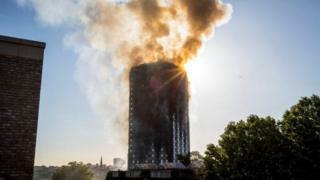 Schools with buildings over 18m (or about four storeys) high were also asked to send samples of any cladding of a similar type and structure to the aluminium composite cladding used at Grenfell for tests at the Buildings Research Establishment in Hertfordshire. And the cladding at London Enterprise Academy, in Tower Hamlets, and The Bridge primary school, in Islington, had failed these safety tests, said the spokesman. However, fire experts have been into both schools to ensure systems are in place for evacuation. They had also advised that the design of these buildings meant the risk was not of the same order as that of housing, the spokesman added. Checks by the Scottish government have found that no Scottish local authority-owned school buildings above 18m contain aluminium composite cladding of the type used at Grenfell. The Scottish government has also asked universities and colleges to carry out fire assessments on their buildings and some cladding is being removed from a hall of residence at Edinburgh Napier University. The Welsh government has also written to schools asking them to check the cladding on their buildings, with a particular focus on any buildings that are more than six storeys high.